Do you fancy a special date at the movies tonight? There’s only one place to head: the Thames. Sound the foghorn! 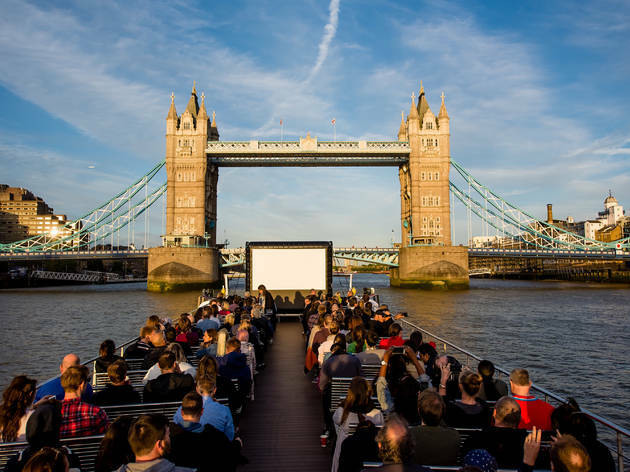 The outdoor screening series Movies on the River sets sail tonight, kicking off a summer of films on the top deck of the city’s one and only movie boat, right in the heart of London. Tonight, film-goers will be able to catch a fresh-faced Leonardo DiCaprio in Baz Luhrmann’s 1990s classic ‘Romeo + Juliet’. Screenings will continue five nights a week throughout the summer, with movies including ‘The Greatest Showman’, ‘The Shape of Water’, ‘Jaws’, ‘Ghostbusters’ and ‘Labyrinth’. Each evening, Movies on the River will set sail for a sunset cruise from Tower Pier, before docking in view of the city’s most famous sights to play a film on a big screen on the vessel’s open-air deck. Food and drink will be available to buy all night from the boat’s two bars. If it gets chilly, don’t worry – we have blankets for everyone. Don’t worry about noise either: everyone will hear the movie through state-of-the-art wireless headphones. There’s outdoor cinema – and then there’s Movies on the River. A night at the cinema will never seem the same again after seeing a film on the Thames. Anchors aweigh! Explore the full lineup and buy tickets for Movies on the River.